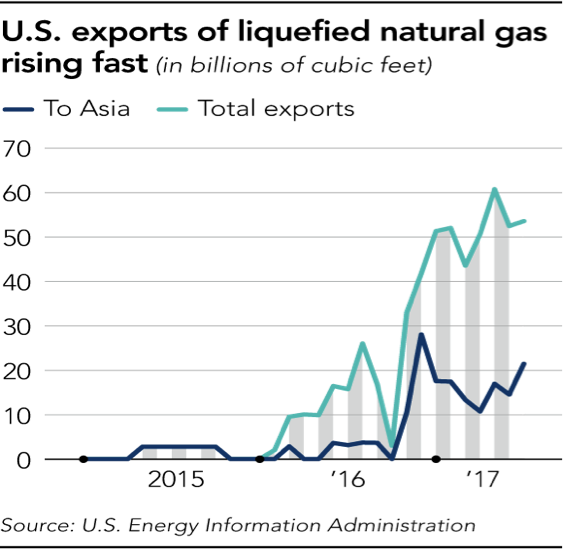 There is currently only one operational liquefied natural gas (LNG) export terminal in the United States; it has been operating since early 2016. Cheniere Energy is exporting LNG at its Sabine Pass facility with three trains and a capacity of about 2 billion cubic feet per day. Its total capacity is expected to be 3.5 billion cubic feet per day when all 5 trains are completed. Cheniere is in the process of getting contracts and financing for a sixth train. Below is a description and status of the LNG export facilities under construction and the date when they are expected to come online. Currently, Sabine Pass is the only active LNG export terminal in the United States. It has three operational trains, and a fourth train expected to be operational this month. Also, a fifth train is expected to be completed in August 2019. The construction of a sixth and final train is subject to the availability of commercial contracts and financing. Each train has a capacity of 0.7 billion cubic feet per day. The Cove Point terminal is expected to be operational by the end of this year. It was constructed by Dominion Energy as an import terminal but is being retooled as an export terminal. Its capacity will be 0.82 billion cubic feet per day. Cameron LNG owned by Sempra Energy is scheduled to begin operation in 2018. It has three trains currently under construction. The first train is expected to begin operation in early 2018, and the second and third trains are expected to start up during the second half of 2018. The three trains will have a capacity of 2.1 billion cubic feet per day. Sempra Energy is also in the permitting stage of constructing an expansion to the facility, which would add a fourth and fifth train. Project completion for the expansion is expected sometime in 2019. Elba Island is a relatively small-scale facility owned by Kinder Morgan with a capacity of 0.35 billion cubic feet per day. It was originally constructed as a regasification plant for imports of LNG and it is being retooled as an export facility. The project will use ten small scale liquefaction units, constructed in two phases. The first phase will begin service in mid-2018, while the second will come online in early 2019. Freeport LNG is a larger facility with three trains currently under construction, which will begin operation between the end of 2018 and the third quarter of 2019, with a combined capacity of 2.14 billion cubic feet per day. A fourth train is under development. There are now floating LNG facilities that cost less than on-shore facilities to construct, are built more quickly and can be moved to where they are needed most. Currently, there are 25 floating facilities worldwide—the first of which came online in 2005. The United States is poised to become one of the top 3 LNG exporters along with Australia and Qatar. 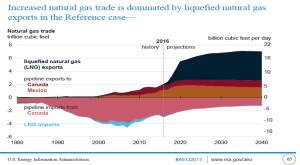 LNG export facilities are under construction and in the next few years the United States will have 10 or 11 billion cubic feet per day of LNG capacity. Countries are looking toward U.S. LNG as a secure supply of natural gas as they plan to use more of the fuel to decrease emissions and diversify their fuel mix.